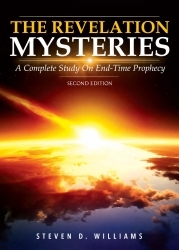 The author of "The Revelation Mysteries - A Complete Study On End-Time Prophecy" maintains, "Over the past 40 years, the Christian community has been bombarded with new Bible versions at a rate of one translation per year. As early as the 1970s, publishers began feeding the Church's frenzy for revelation from God's Word through mass production of new Bible translations. In the decades that followed, the number of versions pumped into the needle-riddled veins of the Church increased steadily with no end in sight." "While those in the pulpit, size up their buffet of Bibles," the author asserts, "they can pick and quote their brand of Christianity at will. As a result, our Christian heritage is steadily being eroded; and it may scarcely be recognized 100 years from today when religious leaders stand up and quote a paraphrase of a paraphrase from a paraphrase that was embraced by the Church of our day. Thus, Christianity Lost." The author continues,"While other world religions appear to hold true to their sacred text, it appears the Christian Church is allowing an unseen force to redefine its heritage. Does anyone care to imagine what would happen to the person in a Muslim country who claimed to have written a New Revised Version of the Quran or a person in Israel who attempted to teach from a New International Version of the Torah? While here is presented two extremes, the Christian Church is at the other end of this spectrum." "In that, the body of Christ," the author says, "appears to sit passively by as the Church, their culture, and their heritage are being methodically redefined." "The Revelation Mysteries - A Complete Study On End-Time Prophecy" released by Hosanna Publishing House, is God's call to man. In this work, God is saying, There is still revelation in His Word; and He is ready to reveal it to His people if they only ask.